Two of Australia’s finest creators, Libby Gleeson and Freya Blackwood have produced a simply beautiful book about everyday life. Both stories in this hardcover book, are focused on Cleo, her family and her neighbourhood. 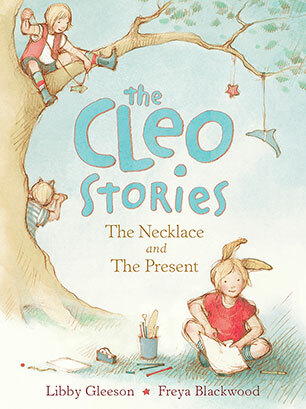 Cleo is a fabulous character – imaginative, curious, quirky and inventive. In The Necklace, Cleo is disappointed most of her friends have necklaces and she doesn’t. She comes up with a colourful and creative solution. The second story, The Present is about that search for a perfect present for a very special person. This really is a beautifully written, illustrated and produced book. It’s perfect for early readers and for bed time reading for children aged between 6 and 9 years. The second book in the series, The Cleo Stories – A Friend and a Pet, is every bit as delightful.